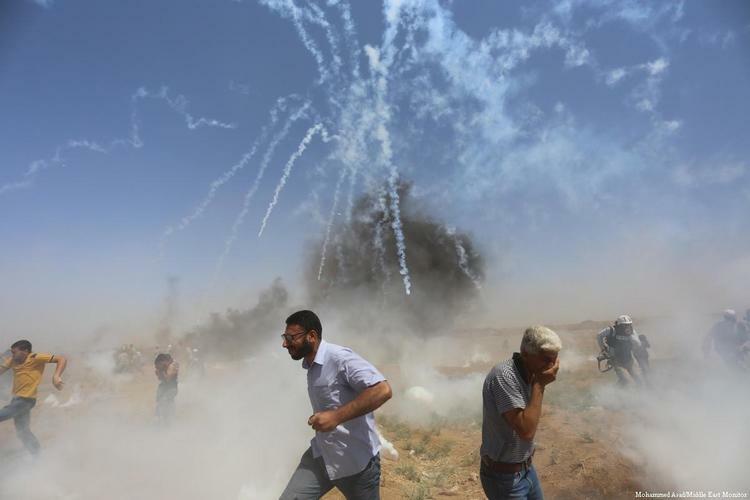 At least 525 Palestinians have been wounded on the Gaza border by Israeli occupation forces who violently suppressed protests as part of Al-Quds Jerusalem Day, the Ministry of Health said today. The Gaza Ministry of Health said at least seven people were in critical condition as a result of their injuries. Israeli soldiers fired tear gas canisters and live ammunition at demonstrators as they called for an end to the stifling 11-year blockade. At least three journalists have been wounded as they attempted to cover the protests, with Muhammad Al-Baba suffering injuries to his right leg after a gunshot wound. Palestinian factions, youth organisations and national figures had called on the public to devote the last Friday of Ramadan to protest against the occupation at the border. Demonstrations also occurred in the occupied West Bank, with events held to mark the Million Man March to Jerusalem at Al-Aqsa Mosque. The latest demonstrations are the first since Palestinian paramedic Razan Al-Najjar was killed by Israeli sniper fire last week. The 21-year-old’s death sparked outrage and an outpouring of grief across the world, with thousands of Palestinians attending her funeral, dubbing her “the angel of mercy”. At least 123 Gazans have been killed since the Great March of Return started on 30 March. The protests were launched by thousands of Palestinian civilians in Gaza who took to the borders to demand their right of return to their original homelands, called for ending the 11-year siege on Gaza and protested against the opening of the US embassy in occupied Jerusalem. Featured Photo: Israeli forces fire tear gas at Palestinians during a protest at the Gaza – Israel border on 8 June 2018 [Mohammed Asad/Middle East Monitor].